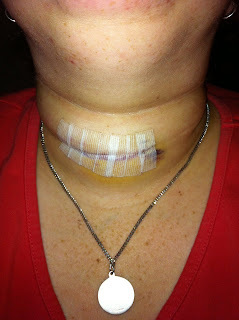 The doctors were able to confirm thyroid cancer during my thyroidectomy. I have not talked to my doctor yet, but here is what I know. 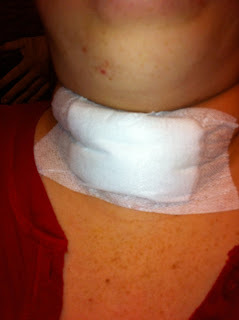 The cancer had adhered to both my voice box and windpipe and they were able to remove it. 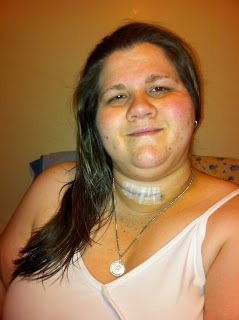 I will follow up with my ENT on August 4th… and in the mean time I have my first oncologist appointment on August 1st. He will be taking care of all of my thyroid needs like hormone replacement and further testing and radioactive iodine treatments. He should be starting me on Cytomel at my appointment on Monday and giving me more information on what the next step is. I know there was talk of a whole body scan… so we will see. 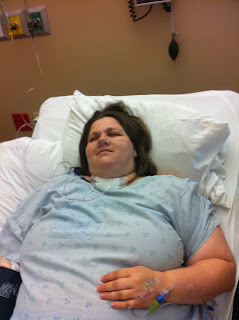 I went in for surgery with a wicked cough… and I came back out with it too! OUCHIE! I don't remember much about my recovery in the hospital… but I do remember them not letting me have any pain meds for awhile because of "complications with sleep apnea" I recall throwing up once, and occasionally flipping my mom or brother the middle finger… lol! When I finally started to come to enough to start asking questions I found out about what happened in recovery. Apparently the combination of my sleep apnea and the sedatives caused me to stop breathing and they had to manually resuscitate me! They released me the same night after midnight. Healing has gone well… the swelling is down and I can see some bruising underneath the steri-strips. Once home I discovered a large goose egg on the back of my head… possibly from when I stopped breathing? I'm not sure, but it's painful! My family and friends have been great! They have taken turns watching Henry for me and bringing over meals for us to eat… sending flowers and cards! They are such a blessing! My husband Chad has been a god-send, He has been nursing me back to health and setting up my pillows in bed for me every night! Day four has brought some cabin fever! I don't feel well enough to go out… but I am so tired of staring at these 4 walls! Day four has also brought feelings of "this isn't real" "it isn't really cancer is it?" "how can I have cancer? " "cancer only happens to other people"
I am having trouble wrapping my head around the whole cancer diagnosis. I had this little bit of hope going in to surgery that they would overturn the whole biopsy results and when I came out and it was confirmed cancer I was heart broken. Now I have an oncologist… can you believe that I have an oncologist?? It seams so surreal.